The topic of nursing home care is a struggle for many families. It’s not often discussed until a parent, grandparent or loved one’s health or living situation becomes a crisis. Seniors and family members may feel emotional, hurried and stressed when looking for solutions to their needs. Decisions are sometimes made quickly and may not have been made with more time to plan. Know the need. Long-term care is on-going personal care. Individuals who may need long-term care are those who have chronic illnesses or dementia and can no longer be cared for at home. They need help with everyday activities like medication management, bathing, dressing, grooming, using the restroom, eating and moving around. Consider. What is important to you or your loved one? Do you want a place close to family and friends so they can visit? 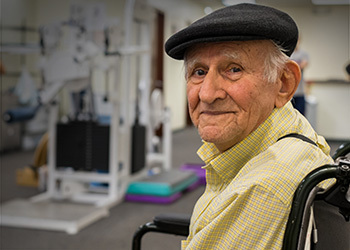 Do you want a community with nursing care, meal plans, physical therapy, a religious connection, or Special Care Units for dementia patients? Ask. Talk with friends, relatives, social workers and religious groups to find out what places they suggest. Check with healthcare providers about which nursing homes they feel provide quality care. Use those suggestions to make a list of communities that offer the types of services you want. Call. Get in touch with each community on your list. Ask questions such as how many people live there and what the costs include. Find out about waiting lists, too. Visit. Make plans to tour each community on your list and make a point to ask if you can meet with the community’s Social Services Director. Our social workers are patient advocates and help answer questions you may have about the care your loved would receive in each community.